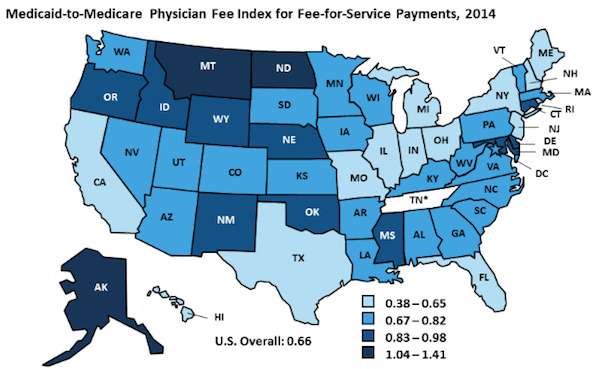 Notes: The Medicaid-to-Medicare fee index measures each state’s physician fees relative to Medicare fees in each state. The Medicaid data are based on surveys sent by the Urban Institute to the 49 states and DC that have a fee-for-service (FFS) component in their Medicaid programs. These fees represent only those payments made under FFS Medicaid. *Tennessee does not have a FFS program. Data Source: Stephen Zuckerman, Laura Skopec, and Kristen McCormack, “Reversing the Medicaid Fee Bump: How Much Could Medicaid Physician Fees for Primary Care Fall in 2015?,” Urban Institute, December 2014. This entry was posted in Data Watch on February 8, 2017 by Genevra Pittman.